The upper working temperature for 90-10 and 70-30 Cu-Ni is normally about 250°C. Copper Nickel Condenser and Heat Exchanger Systems; W. Kirk and A. Tuthill; CDA Inc Seminar Technical Report 7044-1919. The Application of Cu-Ni Alloys in Marine Systems. Fine Wall(22BWG) 90-10 and 70-30 Cu-Ni Condenser Tube Use at the Hennepin Energy Resource Company Power Plant; W.E. Helliwell and G.A. Anderson; PWR-Vol 30 1996. Joint Power Generation Conference Vol 2 ASME. 1996. The Use of Cathodic Portection for Copper Alloys in Seawater Cooling Systems; by L. Berthagen; Eurocorr 2001 Marine Corrosion Working Party Meeting. Wolverine Engineering Data Book II. Wolverine Engineering Data Book III. Heat exchangers are designed for flow rates more than 1m/s. The higher the velocity the greater the heat transfer efficiency but velocity is limited by pumping cost, pressure drop across passes, tolerance limits of materials. Normally design velocity for Cu-Ni is 1.8-2.5m/s based on uniform non-turbulent flow through the system. Typical maximum velocities for diameters less than 25mm. Care and Maintenance of Copper Alloy Tubed Condensers-Construction Through Early Life. William Sartor; CDA Heat Exchanger Seminar 1981. Heat Exchanger and Piping Systems from Copper Alloy- Commissioning, Operating and Shutdown; M.Jasner et al. ; KME publication 1998. Protection of Seawater System Pipework and Heat Exchanger Tubes in HM Surface Ships and Submarines in Sea Water Systems; UK Ministry of Defence Standard 02-781 Issue 2; May 2009. Tubesheets should not be more noble than the tubes as this can cause a galvanic influence on the corrosion rate of the tube ends. Therefore 90-10 Cu-Ni tubesheet can be used with 90-10 Cu-Ni tubes. Also, Naval brass, Muntz metal and aluminium bronzes are slightly anodic to 90-10 Cu-Ni tubes and are therefore compatable.70-30 tubes should have 90-10 or 70-30 tubesheets. 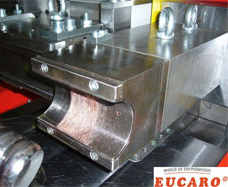 For clad tube sheets, welded tube to tube sheet joints are preferred. There are many different tube/tube sheet (T/TS) weld joint designs used in industry and each has their particular advantages and disadvantages. The more common joints are the flush tube, recessed tube, trepanned tube sheet, added-ring and face side fillet weld when the weld is made on the tubesheet face. A mechanical joint is not used for severe services where a leak could present a catastrophic safety hazard. When a tube-to-tubesheet weld is made in a Cu-Ni construction, it is most often an automatic gas-shielding tungsten arc (TIG) weld made either with or without filter metal. 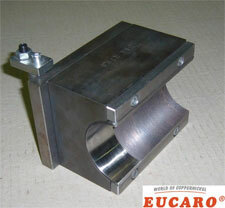 Manual welding might be used on special designs and is often the standard method for weld repairing. With manual welding filler metal addition is recommended, particularly to avoid porosity from lack of complete gas shielding over the molten weld metal. While the TIG process is well adapted to make T/TS welds with thin wall tubes, other welding processes may be better suited for large diameter and thinner wall tubes. Alternate welding processes include manual metal arc (MMA), metal inert gas (MIG) or plasma arc. Explosion welding is another joining option although it is seldom used in Cu-Ni construction. There are many different T/TS weld joint designs used in industry and each has their particular advantages and disadvantages. The more common joints are the flush tube, recessed tube, trepanned tube sheet, added-ring and face side fillet weld when the weld is made on the tubesheet face. Successful T/TS welding depends to a very high degree on the accurate machining of holes, joint preparation on the tubesheet and cleaning all surfaces prior to welding. Accurately machined holes are particularly essential for automatic welding to assure the tungsten electrode is always positioned correctly in the weld joint. 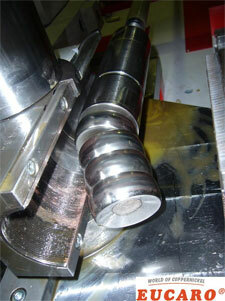 Cleaning problems start with the contamination of the tubesheet by the hole drilling lubricants. The tubesheet should be cleaned immediately after drilling and positioned so that during cleaning the contaminants drain from the tubesheet and do not accumulate on one surface. Compressed air should not be used to 'blow off' the cleaning solution unless equipment is installed to remove the normal moisture and oil contamination. Dry nitrogen is often a good alternative to compressed air. Prior to T/TS welding, it is often desirable to expand the tube into the tubesheet, for example by a 'light roll' to assure the tube is centred in the hole for good tracking in automatic welding. A 'hard roll' prior to welding increases the chance of producing a weld defect from escaping gas as the weld is being made. After the T/TS weld is made on thicker tubesheets, the tube is often given a 'hard roll' stopping about 25 mm short of the back side. A visual inspection should be made for weld defects in the completed T/TS weld. A liquid penetrant inspection of the welds is also quite standard. Other inspections that might be imposed are a leak test and in some T/TS designs a radiographic inspection can be made of selected areas. Defects such as cracks or porosity should be ground out and a manual TIG repair with filler metal made. Tube/Tubesheet Joining. Carl Gaffoglio; CDA Heat Exchange Seminar 1981. Cu-Ni is used for piping systems in a wide range of sizes. Attention to velocity limits and good commissioning practices are the main requirements to achieve excellent service. Materials Selection for High Reliability Sea water systems; B.Todd. CDA Inc Seminar Technical Report 7044-1919. The Application of Copper Nickel Alloys in Marine Systems. Typical Failures of 90/10 CuNi Sea water Tubing Systems and How to Avoid Them. W Schleich. Eurocorr 2004, NICE, September 2004. Application of Copper-Nickel Alloy UNS C70600 for Seawater Service. W.Schleich. Paper 5222 Corrosion 2005. (©NACE). For a description of fittings and their properties, see System Design section. This section covers tube bending methods, gives a detailed illustration of rotary draw bending and describes bending defects and how to correct them. Various methods can be used for bending tubes depending on the material in use and the required precision. 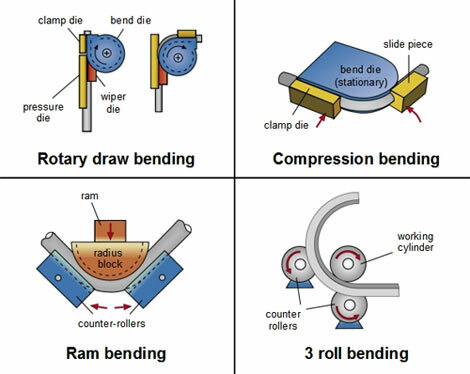 The more common procedures are rotary draw bending, 3-roll bending, compression bending and ram bending (press bending) ( Figure 1). Rotary Draw Bending is the most versatile and precise bending method ( Figure 2). It consistently produces high quality bends, even with tight radii and thin tube walls. The following tools are required for pipe bending ( Figure 3). For rotary draw bending, the tube is inserted into the bending machine and clamped between the bend die and the clamp die. Figure 4 shows the bending process as described earlier. When bending Copper-Nickel, a mandrel and wiper die are also applied (mandrel bending). With modern mandrel bending machines, almost any kind of cold-formable tubes - depending on the applied material - can be bent to bending radii of approximately 1xD to 5xD (referring to the outer diameter of the pipes), safely and with the desired precision. Today, the main differences in rotary-draw-bending machines are the maximum workable outside tube diameter and the degree of automation of the various functions. 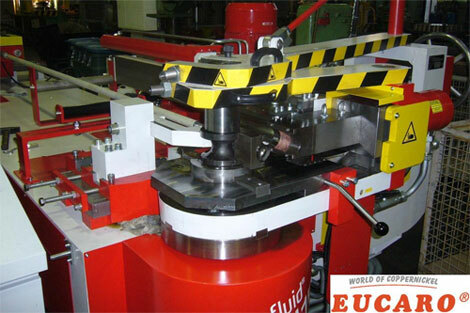 Only the bending function of so-called "1-axis controlled" bending machines is automatic; feeding and rotation of the tube between two bends are carried out manually. For the user of CNC (Computer Numeric Control) or bending machines with fully automatic control, however, all functions are available automatically. These bending machines can be supplemented with automatic feeding and unloading systems for large production runs without any problems. Wrinkling throughout bend, even extending into wiper die area. 1. Advance wiper die closer to tangent. 2. 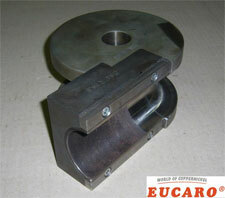 Decrease rake of wiper die. Wrinkling throughout bend area with wiper and mandrel in known proper position. 1. Check for undersized mandrel. 2. Increase pressure die force only after checking wiper fit and mandrel location. 3. Reduce force on pressure die advance. Excessive collapse with or without wrinkling throughout entire bend. 1. Advance mandrel toward tangency until slight hump occurs (most mandrels must project to a certain extent past tangent). 2. Need more balls on mandrel. Heavy wrinkles through bend area only and linear scratches in grip area indicating clamp slippage. 2. Check location of mandrel and wiper die (and lube). 3. Increase pressure on clamp die. 4. 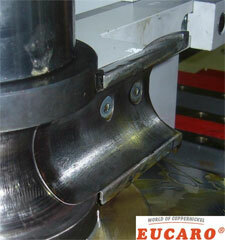 Use serrated or carbide spray in tube groove of clamp die. Wrinkling occuring for only a portion of the bend (45° out of 90°). 1. Check if bend die is out of round or there is a bad centering ring or counter bore. 2. Check if there is a taper in the pressure die (from bottom of tube). Buckle at the end of the bend. 1. Adjust mandrel slightly back from the tangent until the buckle is barely visible. 1. Too much drag on tube; back off pressure die force-increase wiper die rake. 2. May require closer pitch mandrel ball assembly. 3. Tubing material too soft. 4. Increase force on pressure die assist. Tool marks on centerline of bend. 1. 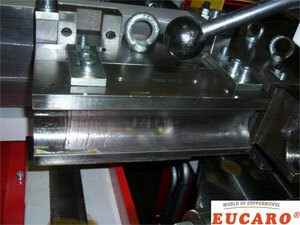 Re-adjust vertical alignment of clamp and/or pressure die. 2. Undersized tube groove in bend die. Tool marks on centerline of bend in clamp and pressure die area. 1. Reduce pressure and clamp die forces. 2. 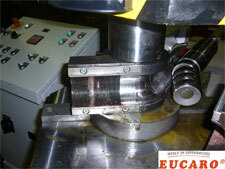 Check for oversized tube or undersized tube groove from bad tooling source. Bad mark at start of bend and over bend for 90°. 1. Check if removable clamping portion of bend die is not matched properly to round part of bend die. 2. Check if clamping portion of bend die is not parallel to the key way. Excessive collapse after tubing is pulled off mandrel balls. 1. Check for too much drag on tube; back off pressure die force; increase rake on wiper die. 2. Increase mandrel to support; change from a plug to a one ball; a 3 ball instead of a 2 ball mandrel. Deep scratches throughout the bend and in wiper die area. 2. Check for undersized mandrel. 3. Increase pressure die force only after checking wiper fit and mandrel location. 4. Reduce force on pressure die advance. 5. Use more and/or a better lubrication. Centrifugal pumps are often used in seawater systems; the main components being the casing and the impeller. Cast alloys such as gun metal, nickel aluminium bronze and cast copper nickel can be suitable for the casing in copper based piping systems with alloys of resistance to higher water velocities for the impeller such as alloy 400 or nickel aluminium bronze. Appropriate attention has to be given to galvanic considerations when selecting materials. Materials Selection for High Reliability Seawater Systems; B.Todd; CDA Inc Seminar Technical Report 7044-1919. The Application of Copper Nickel Alloys in Marine Systems. The three main components of a valve are the body, seats and shafts or stems. Copper based alloys such as nickel aluminium bronze, gun metals and cast copper nickels are often used for valve bodies with alloys which are more noble and have resistance to fast flowing sea water for the seat or stem. 90-10 and 70-30 Cu-Ni alloys are widely used for water boxes in ships and desalination service.